2009 CENTURY LINEUP: The initial lineup of eligible events for the 2009 WBC pending GM commitments is now posted. Our usual in-depth analysis of each event has been delayed by late GM reports but will be available before the December membership drive to aid you in deciding what events to support in 2009. Those 2008 Event After Action Report pages complete with the latest Laurel counts and photos as only WBC does them will be available soon. BOVE WINS SIEGELMAN: Despite concerns about the economy and incomplete renovations at the Days Hotel, the sixth rendition of EuroQuest managed to hold steady with approximately 250 in attendance. Top individual honors for the weekend went to Alex Bove, the 2007 runner-up to Rob Kircher, who reached four tournament finals and compiled 24 points to 22 for the reigning Caesar, Raphael Lehrer. Alex won the Harald Siegelman Award despite winning no events to Raphael's two by scoring in six of 11 main event tournaments. For the second straight year, it was Raphael who won the most games overall (18) but because he posted wins in two fewer events, Alex scored higher. Defending Siegelman champ Rob Kircher competed well also, winning a total of 17 tournament games and placing fifth in the Wild Card tourney while also winning games in seven main event tournaments to place third, two points behind Raphael and four behind Alex. See the winners. The winners and laurelists for all events with updated laurel totals will soon be listed on their respective event AAR pages. EMERY WINS WATERLOO: John Emery bested Rich Shipley and Kevin Sudy in a 5-turn Final to win championship wood at Waterloo VI on October 26th in Towson, MD. John, playing the Austro-Russians, won despite submitting with the Austrians on Turn 1. The tournament saw 39 games played by 24 combatants with the new 2nd edition rules. Read complete details on this unusual Final and the weekend in general. NEW MEMBERSHIP POLICY: In 2009, we will be extending WBC to a full week running from Monday morning through Sunday evening with assorted pre-cons during the previous weekend. This has been done to accommodate the growing number of early arrivals during the Sampler Showcase looking for Open Gaming opportunities. The Showcase will no longer be considered a Pre-Con and will be open to all paid WBC attendees. Additional space has been secured to handle the influx of open gamers this has created. A small number of events will continue to be run on Monday to augment the Sampler Showcase, but the bulk of Tuesday will remain dedicated to the Auction and Auction Store as in the past. A normal Sustaining Membership will now cover all WBC events from Monday thru Sunday and will cost $70. However, all members joining by the December 31st deadline will receive both a free full-color Yearbook mailed in May and a WBC Souvenir T-Shirt upon arrival. Those joining After the New Year will be able to purchase these items separately only while supplies last. The convention schedule will remain separate from the full-color yearbook in a smaller, one-color booklet made available at registration. This policy ensures that everyone who attends WBC will get a printed schedule, while preserving one of the unique traditions that IS WBC—our full color souvenir Yearbook. Check the full details on our membership terms page for payment deadlines and shirt size exceptions. updated list of those that will be on the ballot. We are also always in need of volunteers to GM or assist Juniors/Teen events and to offer Seminars. If you're looking for a way to give something back to your hobby, here it is. renovated Days Hotel. The Winter Activation Meeting is again the week before the Super Bowl. The focus of this four-day event is to provide a gaming convention for the two-player historical "card-driven" boardgaming community: players and designers. This year we have decided to abandon the Open Play format that we have been using in recent years and will be making WAM a more structured event. While the "organized chaos" approach was popular with some, it was less so with others because the high number of tournaments diluted participation and also because it was confusing to new attendees and difficult for the GMs to run. We will be offering the following titles as fully sanctioned BPA tournaments with full laurels to be won: Paths of Glory, 1960: Making of the President and Twilight Struggle. In addition, as we anticipate the publication of several new CDG titles in the coming months, we will also be adding a fourth tournament as January approaches (much as we did with 1960 at last year's event). If none of the new games are tournament friendly or published in time we will bring back one of the old standards such as Hannibal or Wilderness War. These are the only official tournaments that will be run and all four events will have a set schedule. Participants are also welcome to open game to their heart's content, so bring your other CDG titles along. BPA has obtained a very favorable group room rate of $79 per night plus applicable state and local taxes (currently 13%). The hotel is newly renovated so enjoy this rate for the last time. Prices will be increasing next year. See details at http://www.boardgamers.org/specific/wam09ann.htm. TWILIGHT STRUGGLE SEMIS: A total of 213 games have been played by 86 entrants in the six swiss rounds to reach the six-player Single Elimination rounds. Three-time WBC champ Stefan Mecay, the #5 seed in the elimination portion, has defeated the Soviets of #4 seed Suzanne Tuch with a +20 VP auto-victory on Turn 7. George Seary, the #6 seed, has likewise defeated the Americans of #3 seed Bill Edwards with a -20 VP auto-victory on Turn 5. The two survivors now enter the Semi-finals. Track the details at http://www.kilfara.dsl.pipex.com/TShome.htm. GALLAGHER WINS HERE I STAND: After 22 games, the field of 54 players was whittled down to the six laurelists. 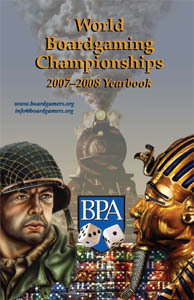 The Final of the first HIS BPA PBeM Tournament reached a satisfying conclusion in late Sept. 2008. Dan Gallagher's Turks were able to outwit, outlast, and secure five Pirating VPs to earn the first PBeM wood. Dan's Turn 5 victory was an outstanding accomplishment given the strength of the other finalists. Key moments in Dan's march to victory in Turn 5 were the three key Piracy VPs the Turks earned to ensure the victory, the play of Servetus for an additonal VP and the stealing of two VPs when the Akinji Raiders snatched the Andrea Doria card from the Hapsburgs. burning of one of the Protestant debaters. Meanwhile Steve Caler as the French and George Young as the English played a steady Tournament Final that saw them poised for a big Turn 6 that could have secured the victory, but alas it was not to be. The final results for all the participants were thus: 1st - Dan Gallagher 24 VPs (Turks), 2nd - Rob Seulowitz 21 VPs (Hapsburgs), 3rd - Stever Caler 21 VPs (French), 4th - Mike Brophy 18 VPs (Papacy), 5th - George Young 18 VPs (English), and 6th - Jeremiah Peterson 17 VPs (Protestant). Appropriate laurels will soon be posted on the BPA HIS page. DELUXE BITTER WOODS: Jan. 15 will be the start of a new BPA PBeM tournament featuring Patton's Relief of Bastogne scenario in a Single Elimination format. Seeds will be determined by AREA rating with no byes awarded. "Eliminator" opponents will be assigned in place of byes. For details go to home.comcast.net/~bitterwoodsweb/BWHome.htm or contact the GM at brunofjs@hotmail.com. http://www.gameaholics.com/adv_format.htm and enter by contacting John Pack at john@gameaholics.com. Make this holiday season one to bluff your way through. Your turkey will taste much better in anticipation!" been a potpourri of experiences throughout. Last updated 11/19/08 by kae.